Gwyneth Munjoma, Senior Associate from Tees Law said; “I personally find Helen Rollanson Cancer Charity (HRCC) a champion in the field of cancer charity work. The whole team is absolutely dedicated to the work it does. HRCC provides a unique and niche service to cancer sufferers in our region to make life liveable. 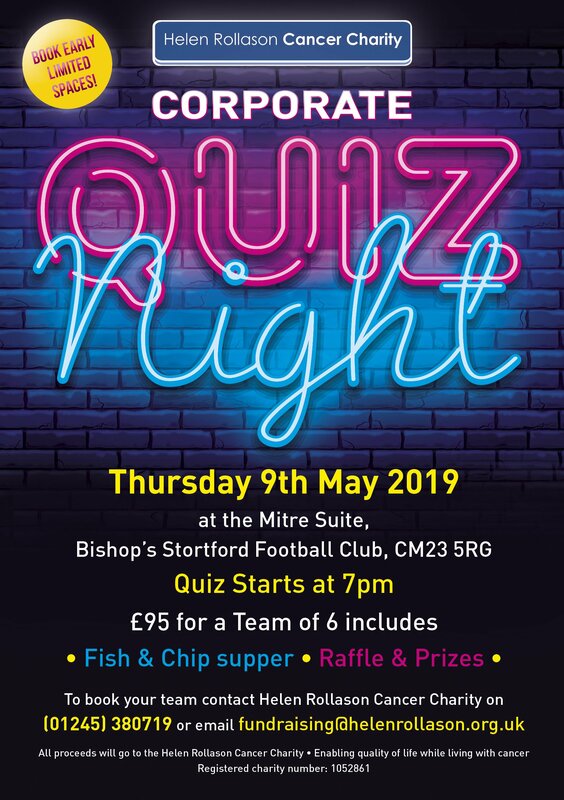 Karen Mitchell, Corporate Fundraiser for Helen Rollason Cancer Charity said; “This will be a light-hearted evening where everyone will be able to stretch their brain cells for a good cause. If you are a business owner looking to fulfil your corporate social responsibilities, looking for a team building event, an informal networking opportunity or simply fancy supporting HRCC in a fun way, we would love to welcome you along! £95 for a team of 6: Corporate teams should register by calling 01245 380719, stating their team name and team details. Quiz begins at 7pm. Bar available. Please note there is a limited capacity so places will be reserved on a first come first served basis.